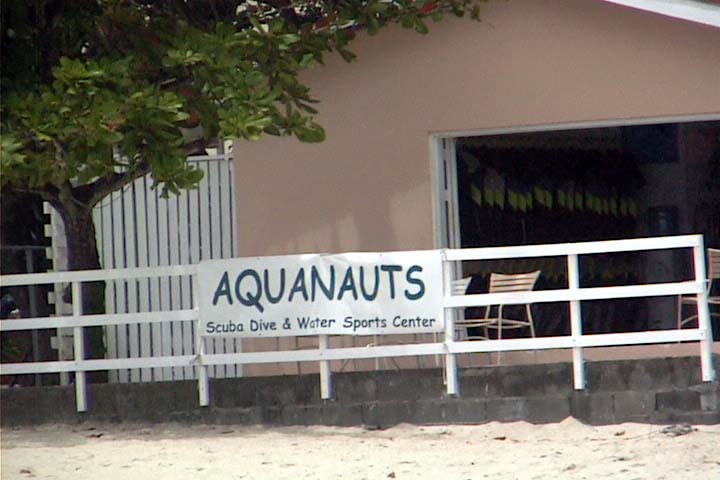 The Aquanauts have two locations in the area south of St. George's, Grenada. Above, you see their Grand Anse Beach site, along the most beautiful beach in Grenada. The boats leave from Renezvous Bay Hotel across the island in Rendezvous Bay, near the boatyard on the Atlantic side. Peter and his wife manage the dive operation with the assistance of Pete and Paul. They both double as captains and divemasters, and their comaraderie greatly increased the enjoyment of the trip. If you are with Pete and like to slowly explore a reef, tell him you want to go "Poodling." 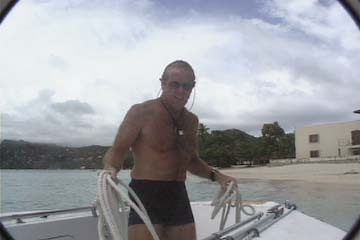 My diving in Grenada took place in June, 2002. Peter told me that this was about the worst time of year for diving in Grenada as weather conditions prevent access to the most pristine dive sites, but I thought the diving was wonderful. About 3/4 of their dive boat was covered, protected from the sun, a situation I appreciate. 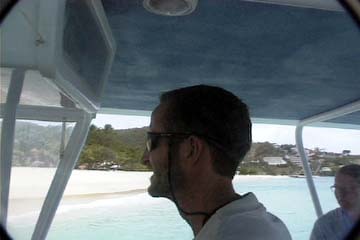 Also on the majority of our dives, there were only four or five divers on the boat. Again, this situation was wonderful, though I'm sure they carry more divers in season. Most of the diving we did was drift diving. Sometimes the current was very slight, and sometimes it drove us down the reef. Consequently I would recommend that novice divers check the current before diving or ask the captain to head for more protected waters. Buoyancy control can be very important at some of the sites in the current. Many of the most impressive sites were wrecks, including the Bianca C, the Buccaneer and the Quarter Wreck. 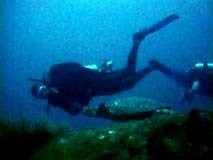 In our first dive at the Bianca C, Peter and I swam alongside a large green turtle for a few minutes. The turtle wasn't afraid of us at all. At the Quarter Wreck, we ran into a beautiful scorpionfish, a huge, ancient green moray, a beautiful yellowtail damselfish, many sergeant majors and a few tiny blennies. Wherever we went, the crew was very courteous and helpful. When people hear the name, Grenada, the only thought they have is of Reagan's invasion of this island country. However Grenada is the Spice Island of the West Indies. 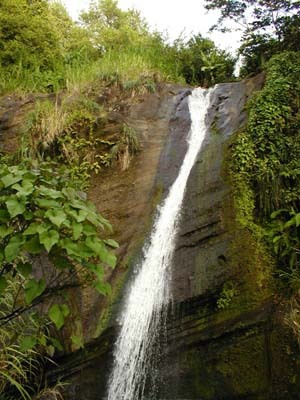 There are beautiful beaches, waterfalls and a rainforest. We were lucky enough to have, as a guide, a friend of a relative who is attending St. George's Medical School. 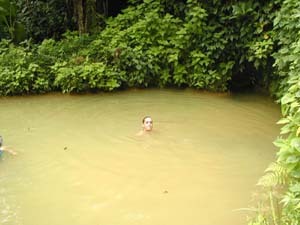 Through him, we saw many of these sights plus meeting many memorable locals, such as Nimrod, who owns a local rum shop. 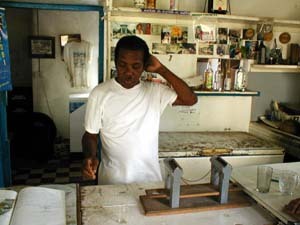 These small rum shops dot the entire island, as there is a rum factory on Grenada powered by burning sugar cane stalks. Nimrod is unique as new arrivals are encouraged to partake in the ritual of crossing the bridge, which you can see in the picture. Make sure you have a driver, as this ritual involves chugging very strong rum. We were lucky the days we were guided around the island. However we did venture out on our own. One thing all tourists must know is that Grenada favors the English way of driving on the wrong side of the road. This can be harrowing enough, but it is compounded by roundabouts or rotaries, (depending on whence you hail.) Add to this the locals habit of parking anywhere, anytime to exchange pleasantries with other locals. Also the roads are narrow and very curvy. Places that we would recommend a trip to are the Arawak Perfume Factory, the Vendor's Market on Grand Anse Beach, the Rum Factory, Lavera National Park, Concord Falls, and the Sulfur Springs.